Heavenly Father, today we pray for those scientists working tirelessly to create safe vaccines for combating the Zika virus. We are encouraged by recent reports that up to three solid options for designing Zika vaccines are being pursued, and that all of them are showing great promise. We pray for scientists as they continue the process of determining whether these vaccines are safe in humans, whether they have side effects, etc. We pray the process would be unusually effective, efficient and successful. 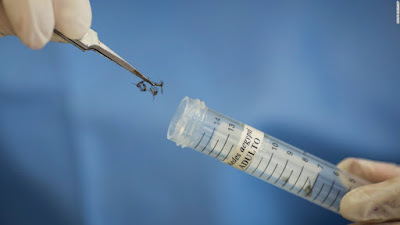 We pray for wisdom in handling the Zika virus as we await the release of the vaccines, and we ask for wisdom in how to handle vaccines, as these can be so controversial for some. Finally, we pray against the continued spread of the Zika virus, that our unborn children would be protected from the birth defects associated with this virus. In Jesus’ name we pray, amen.